It's always a celebration with this irresistible—not to mention gorgeous—cake, starring tulips made from cleverly cut egg-shape JELL-O JIGGLERS! Place one of the cake layers on serving plate; spread with thin layer of the whipped topping. Top with remaining cake layer; spread top and side with remaining whipped topping. Make a zigzag-cut around the middle of each JELL-O® EGG JIGGLERS®; twist to pull apart. Arrange, cut-sides up, on cake to resemble tulips. 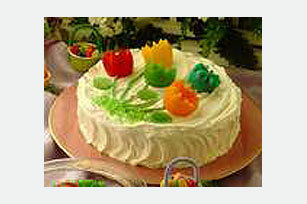 Use decorating gel to draw the tulip stems on top of cake. Place the gumdrop leaves on the stems. Sprinkle cake with coconut to resemble grass. Substitute Creamy JELL-O® EGG JIGGLERS® for the EGG JIGGLERS®. Add few drops of food coloring to coconut in a resealable plastic bag. Close bag and shake bag gently until coconut is evenly tinted.